In recent times, terrorism has evolved and, so too have the methods used to ensure public safety. As vehicle attacks become an ever- growing threat across Europe, perimeter security has become a priority for landmarks and buildings exposed to risk. 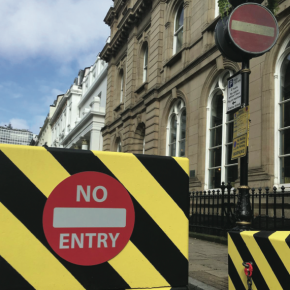 Although specifiers, architects and town planners have always considered perimeter security important for public spaces, the focus now falls on temporary events such as fairs, Christmas markets and festivals to ensure people attending are protected. of elements to ensure an area is safe from vehicle attacks. landscape, using various finishes. The measures used to protect such areas are known as Hostile Vehicle Mitigation (HVM) systems and they often combine a number of elements to ensure an area is safe from vehicle attacks. Traditional perimeter security comes in various forms and can be covert or overt – either blending into surroundings while still safeguarding the perimeter or providing a more imposing visual deterrent. With the former, bollards, planters and concrete seating can be designed to look like a regular part of the urban landscape, using various finishes. It is becoming ever more important to ensure that temporary events, such as festivals, music events and markets where there will be high visitor numbers, have temporary perimeter protection in place. One misconception is that the protection takes too much time to install when, in fact, perimeter protection can be installed quickly and with minimal disruption for the organisers. Installation can be carried out in a few hours, depending on the size of the event. Roughly speaking, it takes around an hour to install 25m of perimeter security. As perimeter security is still a fairly new concept for event planners, it is often the last item to be considered. For many events, a security consultation is required to decide the best approach. Such consultations should assess the surrounding area, define the perimeter and determine the potential vulnerabilities which may be exposed to vehicle attacks. The solution recommended should protect the boundary of an event without stopping the floor of pedestrians. This ensures a high level of security is upheld without detracting from the event itself. Every project is different, and consequently, no solution will be the same. The system should be flexible enough to accommodate variations to street level, road cambers, slopes and uneven terrain festival grounds. It should enable kerb to road transition and be customisable to available street or road widths. Organisers should also question how the perimeter protection has been tested. A good indication is whether the blocks have been tested to an approved VAWs (vehicle as a weapon) standard. The Colmore Food Festival is a free, annual event which takes place over two-days at Victoria Square in Birmingham. For the last four years, local hospitality venues and eateries have used the event as an opportunity to showcase their culinary skills. Townscape was asked to deliver a temporary perimeter security solution which could be deconstructed once the festival was finished. The company provided a full security inspection of the surrounding area and identified weak access points. Following this consultation, 15 of Townscape’s deployable Counter Terror Sentry blocks were installed on the perimeter of Victoria Square to prevent hostile entry from vehicles. 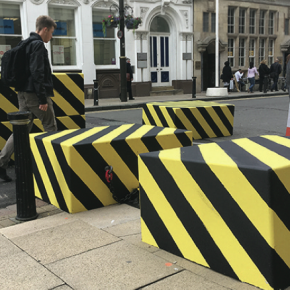 The robust blocks were installed at short notice and at speed to avoid disruption of the event. As the general public’s appetite for temporary events such as Christmas markets, music festivals and fairs increases, temporary event security will continue to be a focus for event planners. Technology will also need to evolve and it is important tht companies take a dynamic approach to provide the best possible protection.